Imposible quejarse por las vistas!! La terraza de este magnífico apartamento se abre directamente a una de las fachadas del templo y al lado izquierdo de la Plaza Gaudí. Quedarás asombrado! Este bonito apartamento disfruta de una posición ideal en el Ensanche de Barcelona. Elegante y refinado, cuenta con un salón comedor con acceso directo a una pequeña terraza. El sofá en el salón se convierte en una confortable cama doble para el 3º y 4º huésped. Si decides comer en casa, podrás reunir tus comensales alrededor de la práctica mesa de comedor con cuatro sillas y deleitar sus paladares con deliciosos platos que podrás preparar en la cocina integrada completamente equipada. El dormitorio, que también tiene acceso a la terraza con vista, dispone de una cómoda cama doble y un amplio armario para tus pertinencias. El baño en-suite es espacioso y está equipado con una cabina de ducha. En la terraza encontrarás una mesa y sillas de exterior para disfrutar con toda comodidad de una de las vistas más exclusivas de toda Barcelona. 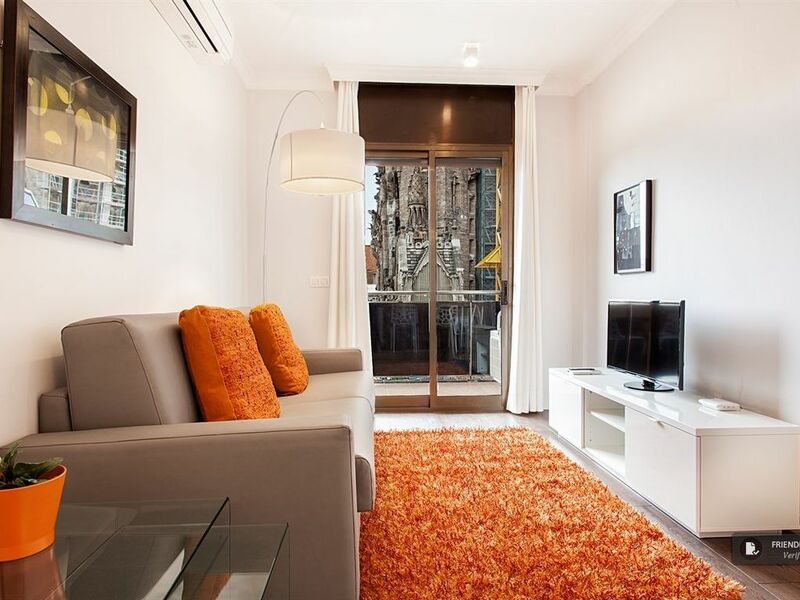 A great apartment directly opposite the La Sangrada Familia. Right above the metro so transport a breeze. Good local restaurants. Would definitely stay here again. Great stay , fabulous apartment location wise. Location was excellent. A few issues trying to use washing machine and dryer. In end couldn't use it. Instructions aren't clear enough. Couldn't use safe in apartment as not working. Only 1 bath towel each provided when staying 3 nights not really good enough. Otherwise everything else was fantastic. The location of the property was unbeatable. Right on the Sagrada Familia. It was very nice being able to sit on the balcony every morning and night. The kitchen was well equipped and we utilized it for nearly every meal. The shower drain didn't work well and it flooded the bathroom the first time we used it, but that's an easy fix. Also, we came home one night and the canvas around the lamp in the living room had broke off and was on the ground. There was tape on it so we assumed it's broken before. I didn't feel like I had good communication with the property owners, especially because it is through a rental company and not just someone wanting to rent their home. Overall, it was a comfortable place with a good location right next to the metro and the Sagrada Familia. The view of La Sagrada Familia from the apartment and balcony was unrivalaled, and an architect's dream. We were able to walk around the cathedral daily, even if we were headed to another part of the city for something else. The subway entrance was steps from the front door, and many eating options were available nearby. We especially recommend the vegan burger bar around the corner.